Ahead of our forthcoming visit to Papua New Guinea, you can find a Wikipedia article about Port Moresby here. 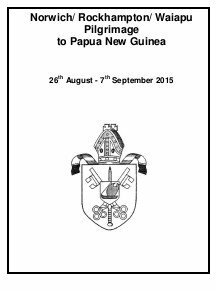 We will be reflecting and remembering on Martyrs Day whilst in PNG, discover the story here. Monday 24 August 2015 Arrive in Brisbane, Queensland. Stay at River Glen. Tuesday 25th August 2015 At River Glen preparing for the Pilgrimage. Spend time in Popondota Diocese seeing the church at work and meeting local people. Sunday 6th September 2015 Attend Church Services and debrief. Monday 7th September 2015 Depart for Brisbane. Enter your email address to subscribe to our newsfeed and receive notifications of new posts by email. Design and build for the web, for communities of faith across the UK.